a. Inflammatory processes as well as fibrosis that arise from the squamous epithelium. The triggering factors for these ailments can be caused by or associated with gastroesophageal reflux disease, esophagitis or ingestion of chemical burns (acid or caustic). Strictures can form after esophageal surgery and other treatments such as laser therapy or photodynamic therapy. While the area heals, a scar forms, causing the tissue to pull and tighten, leading to difficulty in swallowing. b. Neoplasia. Esophageal cancer infiltrates the wall of the esophagus and grows into the lumen, causing dysmotility and obstruction. These lesions are the causes for the stenosis (narrowing) of the esophageal lumen. 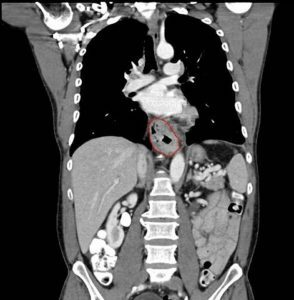 Stipulated by the enlargement of mediastinal lymphatic nodes due to sarcoidosis, lung cancer or by other space occupying lesions in the posterior mediastinum, which may lead to significant compression of the esophagus from the outside. 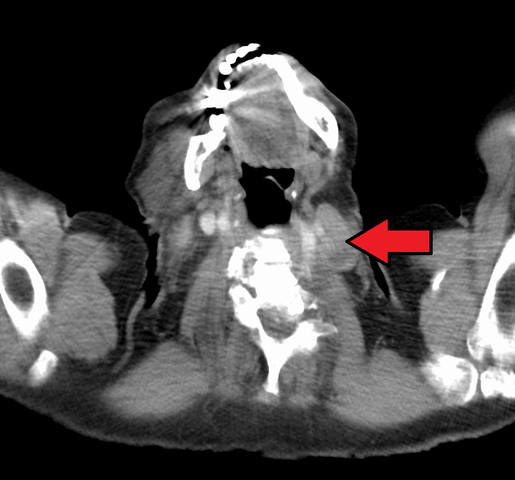 An example is dysphagia lusoria caused by an abnormal take off of the right subclavian artery from the aorta. 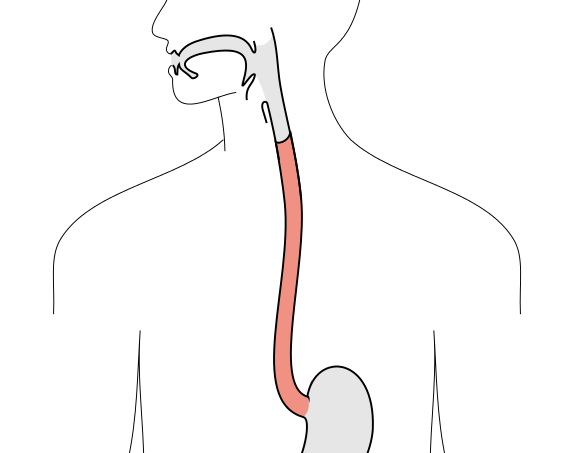 Conditions that affect the tunica muscularis, thus affect the peristalsis of the esophagus and its lower esophageal sphincter (LES). Function of the smooth muscles of the organ and its innervation are compromised. It can be a dysfunctional lower esophageal sphincter or a diffusely disordered motility. Typical example is achalasia, whose hallmark is a failure of relaxation of the lower esophageal sphincter (LES). Apart from the listed above, esophageal strictures can involve the entire thickness of the esophageal wall and be congenital; idiopathic; autoimmune; or iatrogenic including medication- or radiation-induced processes. The diagnosis of esophageal stricture can be confirmed with radiological methods, endoscopic visualization and tissue biopsy, as well as manometry if dysmotility is suspected. Malignant growth is difficult to diagnose in its early and curable stage because of the location of the esophagus deep in the body and its absence of peritoneal coverage that would help limit the progression of the malignancy. It is detected with the help of CT scans and endoscopic ultrasonography. The majority of benign tumors of the esophagus are accessible for endoscopic examination, pharmacological therapy or surgery. Gastroesophageal reflux-provoked esophagitis, originating in the 3-4 cm long squamo-columnar junction. The most common cause of damage to the esophagus is gastroesophageal reflux disease (GERD), also known as acid reflux. Dysfunction of the lower esophageal sphincter (LES) from decreased pressure in this zone of the esophagus may lead to the development of peptic strictures. A LES pressure of less than 8mm Hg contributes to GERD and the development of a peptic stricture. Inappropriate esophageal clearance is often the consequence of dismotility. 64% of patients suffering from peptic strictures have this problem with peristalsis. Hiatal hernia is quite common as it occurs in 10-15% of the population; 42% have reflux with no esophagitis; 63% with esophagitis; 85% of the sufferers have peptic esophageal strictures. Pepsin is no longer considered important in the formation of esophageal stricture as the above mentioned factors; however some authors allege that alkaline reflux affects the mucosa of the esophagus. Gastric emptying may be taken into consideration, though there isn’t convincing evidence about this factor as the trigger for the condition. The USA statistics report that 40% of the adult population suffers from gastroesophageal reflux; moreover, 7% to 23% of untreated patients with reflux disease are exposed to the development of esophageal stricture. Furthermore, up to 80% of esophageal strictures are the consequence of gastroesophageal reflux; after surgery strictures make up to 10%; less than 5% of all cases are attributed to corrosive strictures of the esophagus. The data for the US has improved since 1989 when proton pump inhibitors (PPIs) were administered for the first time. Whites are more susceptible to peptic strictures than colored or Asian people; there are 10 times as many sufferers amongst the former ones as in the latter groups of the population. Nevertheless, this evidence is controversial as the relative frequency of esophageal strictures in colored people (black and non-Hispanic whites) was almost the same. Men are more exposed to peptic strictures than women in the correlation 2:1 or 3:1. The older the patients, the higher the probability of contracting esophageal strictures because the conditions leading to exposure to the acidic components of the gastric juice has persisted for a longer period of time. achalasia can be a reason for heartburn as the result of disrupted esophageal motor activity. Rapid deterioration of the patient’s general condition, weight loss and severe course of the disease are associated with malignancy as the cause of dysphagia. Atypical symptoms: a chronic cough, even asthma attacks as a secondary symptom of the food aspiration. It is crucial to find out whether the patient was taking a regular medication at the time of the manifestation of any of the listed symptoms. Unfortunately, in most of the cases physical examination is not really informative, hence it is vital to estimate the nourishment of the patient. Collagen vascular disease may produce deformed joints, telangiectasia, various rashes, calcinosis, sclerodactyly. Virchow’s node (left supraclavicular lymphadenopathy) is found at times in adenocarcinoma of the gastroesophageal junction. There are no significant changes in CBC apart from those cases when the disease has advanced course (bleeding from the lesions and carcinoma), then CBC may reflect the pattern of anemia. Normally, there is no pronounced picture here; however, the liver tests may be abnormal in malignant processes with metastasis. This method allows the assessment of the nutritional status of the patient with esophageal stricture especially in the case of the significant weight loss. Chest radiography: an additional tool when extrinsic compression is suspected as the reason for the esophageal stricture (posteroanterior (PA) and lateral films). CT scan: CT successfully detects malignant tumors of the esophagus (82% of accuracy). Endoscopic ultrasound (EUS): this method is the most accurate in the diagnosis and biopsy of esophageal tumors (92% sensitive). Esophagogastroduodenoscopy is more sensitive than any other methods and informative in the detection of esophageal stricture as well as esophagitis; confirmation or exclusion of malignant tumors; biopsy, brush cytology specimens and intracavitary administration therapy of the condition. Twenty-four-hour esophageal pH monitoring: this study is useful in the assessment of the efficacy of the therapy with PPIs and fundoplication in those patients who still complain of symptoms in spite of treatment. Esophageal manometry: this study is used for the evaluation of the motility of the esophagus especially before a surgical intervention (antireflux). Presence of goblet cells (Barrett’s esophagus is when the lining of the esophagus changes from its normal lining (squamous cells) to a type that is usually found in the intestines (goblet cells). Progressive inflammation, ulceration, damage of the muscular layers and of the myenteric plexus. 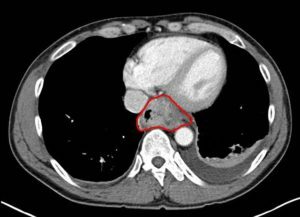 CT (69% accuracy in the estimation of the depth of tumor, 82% in the assessment of the spread within organs) and EUS (92% accuracy in the assessment of the depth of lesions) are informative in detecting the stages of the malignant growth.